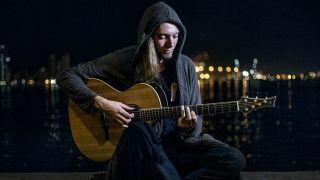 Guitar virtuoso MIke Dawes has released a new video of him covering Metallica's One, and playing every part on one guitar! Who doesn’t love Metallica? Idiots, that’s who. Regardless of your opinion of their more recent material, you cannot deny the sheer power and quality of their first five albums. It doesn’t matter if you’re a metal thrashing mad devotee to Kill ‘Em All or prefer the more accessible Black Album, Metallica have nailed everything put in their path. But it’s not often you see someone really nail Metallica… until now. Countless people have tried to cover Metallica over the years and most are admittedly uninteresting or simply awful, but guitar maestro Mike Dawes has released one of the most impressive versions of One we have heard in a long time. Taken from his upcoming album Era, Mike performs the iconic anti-war song on his acoustic guitar, performing all instrumental parts at once LIKE THE CLEVER GIT HE IS. Era will be released on September 15 via Oten Records, and also includes a cover of Scarlet by Periphery. You can pre-order your copy of the album now.